With all the options in black girls' hairstyles, there's no need to repeat the same 'do day after day. Every style doesn't need to be time-consuming, so when choosing hairdos for young girls, alternate between simpler hairstyles and those that take a little more time. One of the best parts about a style that takes longer to do is that it usually lasts longer as well. Case in point: these adorable braided buns. Begin with a cornrowed base parted down the middle and fashion remaining lengths into cute buns. A child's hair doesn't need to be very long to get this look, either, so don't worry about extensions and the like at young ages. For very young children, including infants and toddlers, Afro puffs are an easy style you can create in minutes. Remember to use metal-free elastics to hold puffs in place and don't pull them tightly as you don't want to cause problems like traction alopecia. Everyone isn't a skilled pro when it comes to girls' hair, so if you're looking for a simple way out, this is a style just about anyone can handle. Fancier, but still girl-friendly, these ponytails are a good protective style. As with the braided buns, begin with a cornrow base and twist loose lengths before gathering them into two pigtails with barrettes on the ends. Let a girl feel a little more grown up with a loose style like this twistout. Begin with a set of two strand twists and leave them in overnight or for a couple of days. This is a smart way to turn one style into two because once the twist style is freed, you end up with a twistout, which you can accessorize with a headband or pretty ribbon. If the simple double ponytail style is more your speed, keep it gentle by using small elastics without any metal parts. Instead of plastic barrettes to hold the ends secure, consider more tiny elastics designed for little girls' hair. When removing any scrunchies or elastics from a child's style, practice patience to avoid pulling out hair. One puff works just as well as two. Dress up the single puff with feminine accessories. There are tons to choose from, and they're available at discount retailers and beauty supply stores alike. Instead of using heavy, sticky gels along the hairline, use petroleum-free pomades or simply a bit of water and a gentle boar bristle brush. If you're feeling adventurous, try combining styles. This 'do begins with flat twists that are secured at the scalp and then twisted to the ends. The loose twists are then untwisted, creating a combo hairstyle that's fun and still age-appropriate. Skilled braiders will find plenty to love in this hairdo for little girls. Give cornrows added interest by parting them on a diagonal and then pulling all lengths back into a braided bun or ponytail. 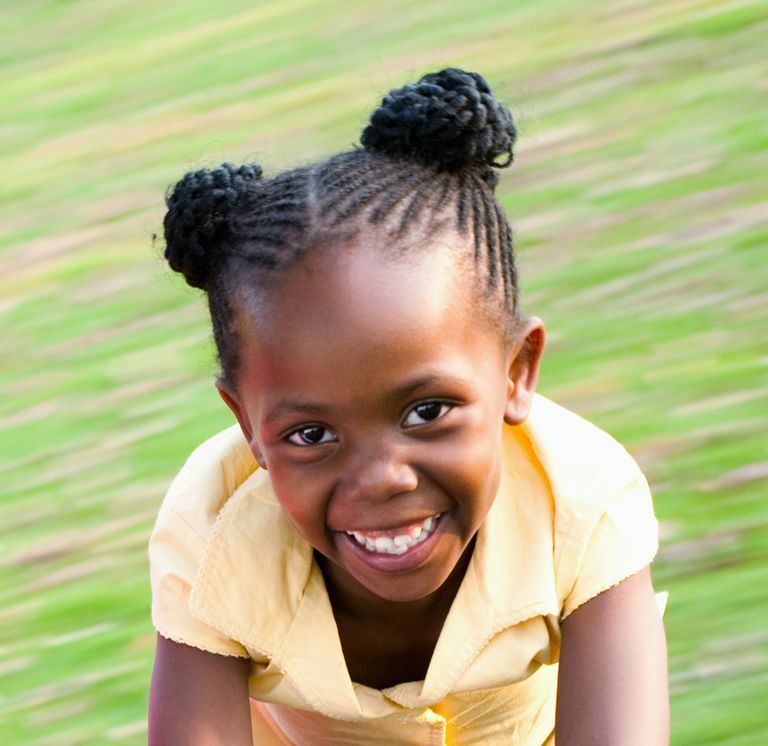 Twists are cute in all sizes, so if you're short on time, consider medium to large-size twists for young girls. This style accommodates even shorter lengths of hair. Even better, parts don't need to be precise since the twists will fall over each other and hide the scalp. Add a barrette, bow or ribbon for a girly twist. What's so great about plaits? This protective style offers so many possibilities. They can be thin or thick, styled on different textures and work with almost all hair lengths. Plus, they're very easy to do: if you can braid hair, you can plait it.